A generation ago these Dietz #041 Railroad Lanterns were used as signals by train conductors and brakemen. The oil lantern construction is for being seen by eyes looking for the signal, not for seeing by eyes. The sturdy design features a protective cage around the glass globe for rugged use. The fount or fuel tank removes by turning it smartly to the right. This dietz railroad lantern burns an average of 3 cents of lamp oil each hour. 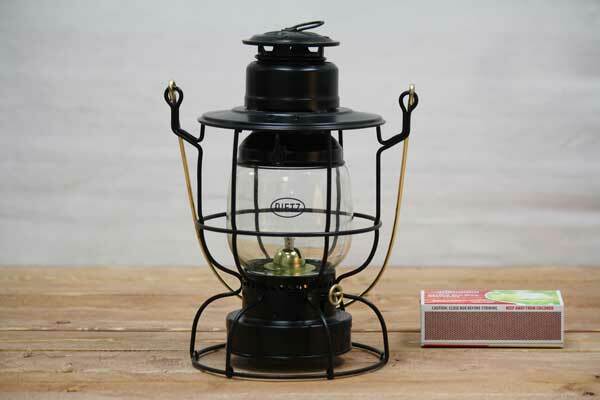 This railroad lantern features a dead-flame lantern style with a candle power of 3. Even if you don't have signals for coworkers passing at night, they will do just fine as timeless accents and twinkling lights in the darkness. Made by Dietz Lantern Company.